A magnificent collar of diamonds and pearls was one of the presents from her father, the Duke of Westminster. It was wearable also as two bracelets, which was pictured in The Graphic in December 1894. His Grace also presented the young couple with one of his new houses in Carlos Place, London. The blue enamel bracelet (converted from a brooch) was inlaid with gold foliate scrolls and decorated with gold shamrocks, roses and thistles, fitted with a diamond rose frame around a miniature of Queen Adelaide wearing a blue dress with a large low ruff and a pearl brooch pinned to the collar. The Marchioness of Cambridge is wearing an ornament of diamonds, pearls and stars, which was later worn as tiara on the top of her bodice. 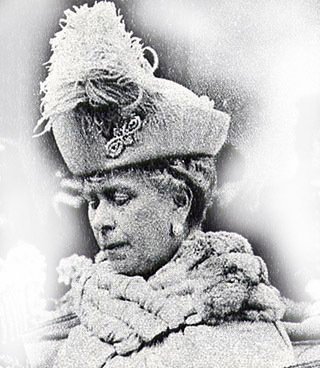 Her large diamond brooch was later in the possession of Queen Mary; she wore it pinned to her hat, see picture on the right. The double-strand pearl necklace that the Duchess is wearing between the choker and the diamond circle necklace has an interesting provenance. Various books state that the pearls came down from Queen Charlotte, and the second Marchioness of Cambridge was the last to wear them probably in 1980 or 1981. The Wedding gifts of Duchess Helen | Die Hochzeitsgeschenke der Herzogin Helen Albany engl.